Can't Any Democrat Here Play This Game? Can’t Any Democrat Here Play This Game? Time to check on the twenty Smurfs. 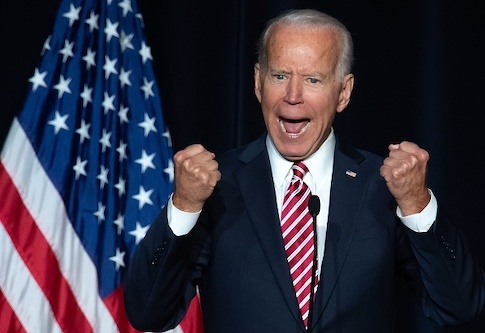 Joe Biden recorded a message on a friend's iPhone in which he admitted that he's made women and "some men" uncomfortable by, among other things, touching them, rubbing their shoulders, and smelling their hair. It's his way of making a "connection," Biden explained, as though he were a domestic animal introducing himself to another pet. Men, women, "young, old," he's touched them all. Handshakes and small talk aren't enough for Joe. He's "tactile." Biden pledged to be "mindful" of personal space because "social norms" have changed since he was born in the late Cretaceous period. He still hasn't announced his presidential run, but has signaled to allies that his prospective candidacy is "full steam" ahead—in which direction, and toward what destination, no one can say. It already resembles one of those Amtrak trains Biden admires so much: rickety, noisy, a relic transiting badlands. Biden's old boss, Barack Obama, has maintained a studied silence throughout the controversy over his vice president's creepiness. So has Michelle. The Obama team appears to be more intrigued by Robert Francis "Beto" O'Rourke, who launched his campaign at a rally in El Paso, Texas, last weekend. Andrew Stiles of the Washington Free Beacon wrote about it here. The AP had to correct its story on the speech, which said, "Mr. O'Rourke also spoke at length in his native Spanish." Dios mio. Beto is as lily-white as Elizabeth Warren, whose finance director is leaving because of a disagreement over money. The director would like to raise some. Warren's not so sure. She pledged not to accept donations from millionaires and billionaires, holding out for small-dollar contributions from folks like you and me. The problem: Folks like you and me don’t want anything to do with Warren. Some of us, apparently, are much more interested in the 37-year-old mayor of South Bend, Indiana. Pete Buttigieg is winning the coveted media primary, as journalists gush over his youth, his Harvard credentials, his husband, and his language abilities. He answers questions in Norwegian. Elect this man! The other day an acquaintance of mine, a reporter for a major newspaper, got caught up in a reverie about the mayor's dogs. They are, I'm told, SO cute. The geniuses narrating our lives can't figure out where Buttigieg came from. Do they read bylines other than their own? The press has been chirping about this boy wonder since a 2016 Frank Bruni column. Now Buttigieg has risen in the polls. He had a solid first quarter for someone without a national profile. The media reputation machine—it builds them up and tears them down—is humming along nicely. I find Mayor Pete far less interesting than what he reveals about the Democratic field. He's upstaged the Washington Senators—Warren, Kamala Harris, Amy Klobuchar, Kristin Gillibrand, Cory Booker, and perhaps Michael Bennet—who have been dreaming of this moment for years. Buttigieg isn't having a moment because Democrats have been waiting decades for a nominee who speaks seven languages and whose husband is good at Twitter. He's enjoying his 15 minutes because even the most talented of these elected officials has yet to stand out. The afterglow of Kamala Harris's successful launch faded rapidly. She's running a professional campaign, raising cash, announcing policies, building coalitions. Don't count her out. Even so, Harris's bid to seize the mantle of "establishment frontrunner" during these early days has fizzled. Her colleagues are no better off. They gab on the talk shows, appear on the cable town halls, join in calls to tear down the Constitution. None commands authority. With one exception: Bernie Sanders. Who isn't even a Democrat. But he looks more like the Democratic frontrunner every day. He is second to Biden in national polls and leading in some states. He's raised the most money and has the most donors, a solid core of supporters, and a simple but comprehensive message of economic and social equality. The party's establishment is leery of him. In these times, that might be an advantage. Born a year earlier than Biden, Sanders is nevertheless more in sync with the moment. Not just because his fans include so many Millennials. Thinking dialectically, as Sanders does, the Vermont senator's democratic socialism is the antithesis to the thesis of President Trump's nationalist populism. He means to work the same changes in the Democratic Party that Trump made in his. He'll be resisted just as Trump was. The question is whether Democratic elites have a better sense of their voters than Republican elites do of theirs. Given the weakness of this gang, is it any wonder that Stacey Abrams is flirting with a bid of her own, and Michael Bloomberg might reverse course and run after all? Why the heck not, considering the competition? This is the opposite of the 1927 Yankees. It's more like the 1916 Athletics. This entry was posted in Columns and tagged 2020 Election. Bookmark the permalink.